Today, we’re paying a return visit to Wade Burleson at Istoria Ministries. Click the title below to read at source. Righteousness is a big, important word that conveys one of the life’s most vital concepts. The Bible declares that God is righteous. “O LORD, God of Israel, You are righteous!” (Ezra 9:15). “The LORD is gracious and righteous; our God is full of compassion” (Psalms 116:5). “The LORD is righteous in all his ways and loving toward all he has made” (Psalms 145:17). The Hebrew word translated righteousness has as its root the meaning of “right” or “straight.” The Old English word used to translate the Hebrew word was “oughtness.” God is right. God is straight. 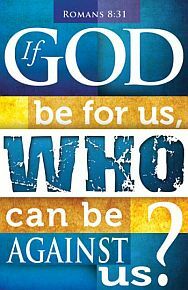 God is as He ought to be. To be righteous is to be right. It is to be a person who is not crooked in character or conduct. However, because of sin in all of us, there is “no one righteous, no not one.” (Romans 3:10). Nobody is as we ought to be. We are not righteous in character, and we are not holy in conduct. Holiness is but the outward expression of internal righteousness, and without holiness “no one will see the Lord.” (Hebrew 12:14). The word “impute” means to “credit to an account” of another. It is an accounting term. When God imputes righteousness, it means that God credits “righteousness” to the account of a sinner. How can I be seen by God as “righteous” when both God and I know that that I’m a sinner. “This righteousness is given through faith in Jesus Christ to all who believe.” (Romans 3:22). God credits me with perfect righteousness when I believe in Christ. My trust (faith) is credited as righteousness to me” (Romans 4:22). “I am found in Christ, not having a righteousness of my own that comes from the law, but that which comes through faith in Christ, the righteousness from God that depends on faith.” (Philippians 3:9). “For if, by the trespass of the one man, death reigned through that one man, how much more will those who receive God’s abundant provision of grace and of the gift of righteousness reign in life through the one man, Jesus Christ” (Romans 5:17). 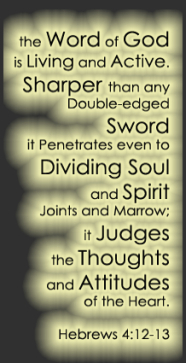 “Imparted righteousness” identifies the internal work of God when He regenerates those who trust in Christ. Believers in Christ become “partakers of the divine nature” (cf. 2 Peter 1:4). It is this principle of righteousness imparted to men in regeneration which is ever in conflict with the old Adamic nature. It is critical, however, to maintain the distinction between the “imputed righteousness” of Christ which is the basis for justification and this “imparted righteousness” which may be seen as the basis for subsequent sanctification. Nobody who knows Christ continues in their sin. We all sin. We who have received the righteousness of Christ have righteousness imbedded within us, and therefore, the characteristics of living right are always present – for we can’t help it. It’s imbedded within our DNA as followers of Jesus. Over the weekend, I wrote a very short story at Thinking Out Loud about what I felt was unnecessary use of the word blessing. 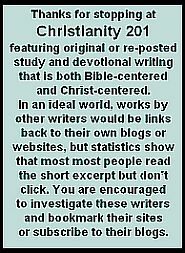 In the course of writing, I decided to investigate how Biblical dictionaries define the word. God’s intention and desire to bless humanity is a central focus of his covenant relationships. For this reason, the concept of blessing pervades the biblical record. Two distinct ideas are present. First, a blessing was a public declaration of a favored status with God. Second, the blessing endowed power for prosperity and success. In all cases, the blessing served as a guide and motivation to pursue a course of life within the blessing. Perhaps the meaning of the word blessing can be most accurately understood when these three etymological meanings—blood consecration, praise, and good fortune—are taken in concert. For example, in Genesis 12:1-3, God makes a promise to Abram, saying, “I will make of you a great nation, and I will bless you and make your name great, so that you will be a blessing. I will bless those who bless you, and him who dishonors you I will curse, and in you all the families of the earth shall be blessed.” God is promising good fortune, and a good future, to the descendants of Abram, and He is saying that others will gain good fortune through him. It can be said that the nation of Israel, and all who believe in the God of Israel, are consecrated with blood—the blood of Jesus Christ—through faith. The Hebrew word barak means literally “to kneel” and when used in this context, it indicates a relationship between man, who adores God by kneeling, and God, who benefits men with His presence. In the April 16, 2014 edition of The Christian Century, a challenging blessing appears (p.9). It was originally given to Brennan Manning by his spiritual director, Larry Hine, on the occasion of his ordination. That you may experience the powerlessness and poverty of a child and can sing and dance in the love of God the Father, Son and Holy Spirit. For today’s thoughts, we’re showcasing a devotional site that is new to us, StudyLight.org and in particular two word studies based on the same passage from Today’s Word with Skip Moen. For those of you who like to dig a little bit deeper, this is a webpage you should plan on returning to often. Clicking this link will take you the page, which shows the reading for that day, but you use a calendar to navigate to other days’ devotionals. Conformed – The word Paul uses for “conformed” is suschematizesthe. A mouthful, for sure. But if we break it down, you will see parts you already know. Sus comes from sum. Of course, it means “with” in the sense of added together. Schematizo is the root verb. We get “schematic” a plan or diagram. Because it’s a verb, the sense is “to make according to a design” or “to fashion like a pattern”. So, we have the meaning. Now we need the tense. That will tell us the “who” and the “when” of this verb. It is plural (all of you), imperative (a command), present tense (an action to do right now), passive (do it to yourself). So, “do not be conformed” is really “every moment, don’t make yourself into a person that is patterned after the world”. My wife has been sewing since she was a child. In her sewing room are many envelopes with patterns in them. When she uses a skirt pattern, even if the material is different in each skirt, the design follows the same pattern. This is what Paul has in mind. He is telling us that the world has a pattern. Even if we make things look different on the outside, that inner pattern will dictate the shape of our lives. Sometimes we aren’t even aware of that design because it has actually formed the way that we think. Let me give you some examples: Do you place a higher value on gaining knowledge than you do on submitting to God’s wisdom? Perhaps you will say, “Oh, no. I don’t do that. I want to serve God’s purposes”. But see how you respond to these implications. How often have you shortened your time studying God’s word so that you could get to a training class for work? How many times have you missed a Bible study because you got too busy with ordinary things? Do you tell your children that the way to success is by getting a college degree? How much emphasis do you and your family put on understanding God’s precise purpose for your daily life or do you “assume” it while you rush to get to work or school? Do you measure achievements according to the standards of your career instead of according to God’s revelation? I have many college degrees. They are displayed on my wall. Do you think that they make me a better person? When you meet someone, do you judge him or her by their accomplishments before you know if they have submitted their lives to God? If someone asks you what you do, is God’s purpose part of your answer? How many times have you turned down a business deal that looked good just because the other party was not a believer and had motivations that were not in the Christian pattern? How often have you measured your success by the number of converts, the size of the choir, the people in the pews or the budget for the building? Transformed – In Greek, metamorphousthe. Another big word, but this one we have in English. Metamorphosis. To change from one thing into another. Caterpillar to butterfly. The two words that make up this concept literally mean to move from one place to another. It is the same word that is used to describe Jesus when he was transfigured from the earthly human form into the divine form of glory in that brief moment on the mountain. Much better than caterpillar to butterfly. From this earthly body to a shape fit for glory. Isn’t that what we want? We want to leave behind this world of toil and care. We want to quit the tears, sorrows and struggles. We want the shape of glory, the everlasting peace of God’s presence. To be really free. Just writing these words brings tears to my eyes. There is something in my soul that longs to be released, to be reunited with my Creator. This word is so much more than the natural process of becoming a butterfly. It is a divine process of the Holy Spirit as I am transformed into the image of Christ. There is nothing on earth like it. And the most amazing thing is that it is happening right now. We don’t to wait until we die to get it started. It won’t be finished until death, but we are already being moved from one place to another right now. The trials of this world don’t disturb me as much as they used to. The sorrows find comfort. The pains find fellowship. My purpose looks forward. God is changing the shape of my pattern. But there is something important hidden in the verb tense. Paul is saying we have to do something. We don’t just sit back and let God work. This is active engagement. Transformation requires participation. Look for the new pattern. Let it sink in. Then, just do it! “Today’s Word” devotional, from Skip Moen . © 2008 is used by permission. All rights reserved. The writers of scripture constantly search for imagery and metaphors to help us understand our God, and yet I suspect none of these comes even remotely close to a complete picture of who God is. Today we pay a return visit to Leon Dean at the blog Come See A Man. Click the title below to read at source. A few days ago, I was chatting with some buddies about the Bible and we came upon the topic of the breath of God. I walked away from that conversation with a deeper appreciation of the sheer power of God’s breath. God is omnipotent. We are not. I can’t do much with my breath than spread a few dandelion seeds around my lawn. 1. With His breath, God created man. Adam was formed out of the dust of the ground, but he was just a lifeless piece of earth until God breathed into him. When God breathed into him, Adam became a living soul. Adam became a human, the most complicated and sophisticated of all God’s creatures. 2. With His breath, God wrote the Bible. Physically, it seems that Bible was written by more than 40 different authors over a period of more than 1,500 years. But in reality, the Bible was written by God exhaling. Because God breathed out the Bible, there are deeper spiritual realities behind the physical words on its pages. 3. With His breath, God destroys His enemies. The most poignant example of victory by breath, however, is still to come. 2 Thessalonians 2:8 describes the fate of the man of lawlessness (Antichrist): “Then that lawless one will be revealed whom the Lord will slay with the breath of His mouth…“ Antichrist will fight with all his might and all his armies, but he will be slain by nothing more than a gentle puff from the the Lord’s mouth. Kind of anticlimactic. 4. 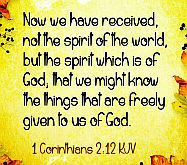 With His breath, God gave us the Holy Spirit. Of all the things that God has done and will do with His breath, this is my favorite. After the resurrection, when the Lord breathed on His disciples, they didn’t just smell the fish He was preparing for them. Through the Lord’s breath, the disciples actually received the Holy Spirit. Today, it is the same. The Lord desires to breathe the Holy Spirit into people. All we have to do is open up and receive. Today we end with the classic hymn Breathe On Me Breath of God. After considering various versions we went with something traditional. Today’s devotional is another in our series of worship songs. You’re encouraged to use the menu in the left margin to explore other songs we’ve considered here. The word “grace” is not always used in the same sense in Scripture, but has a variety of meanings. In the Old Testament we have the word chen (adj. chanun), from the root chanan. The noun may denote gracefulness or beauty, Prov. 22:11; 31:30, but most generally means favour or good-will. The Old Testament repeatedly speaks of finding favour in the eyes of God or of man. The favour so found carries with it the bestowal of favours or blessings. This means that grace is not an abstract quality, but is an active, working principle, manifesting itself in beneficent acts, Gen. 6:8; 19:19; 33:15; Ex. 33:12; 34:9; I Sam 1:18; 27:5; Esth. 2:7. The fundamental idea is, that the blessings graciously bestowed are freely given, and not in consideration of any claim or merit. The New Testament word charis, from chairein, “to rejoice,” denotes first of all a pleasant external appearance, “loveliness,” “agreeableness,” “acceptableness,” and has some such meaning in Luke 4:22; Col. 4:6. A more prominent meaning of the word, however, is favour or good-will, Luke 1:30; 2:40, 52; Acts 2:47; 7:46; 24:27; 25:9. It may denote the kindness of beneficence of our Lord, II Cor. 8:9, or the favour manifested or bestowed by God, II Cor. 9:8 (referring to material blessings); I Pet. 5:10. Furthermore, the word is expressive of the emotion awakened in the heart of the recipient of such favour, and thus acquires the meaning “gratitude” or “thankfulness,” Luke 4:22; I Cor. 10:30; 15:57; II Cor. 2:14; 8:16; I Tim. 1:12. In most of the passages, however, in which the word charis is used in the New Testament, it signifies the unmerited operation of God in the heart of man, affected through the agency of the Holy Spirit. While we sometimes speak of grace as an inherent quality, it is in reality the active communication of divine blessings by the inworking of the Holy Spirit, out of the fulness of Him who is “full of grace and truth,” Rom. 3:24; 5:2, 15; 17:20; 6:1; I Cor. 1:4; II Cor. 6:1; 8:9; Eph. 1:7; 2:5, 8; 3:7; I Pet. 3:7; 5:12. More resources on the topic of grace are available at Bible Study Tools. song lyrics by Gerrit Gustafson, music by Don Moen; another version on this video. Lots of text today, but you need to click through to read it. This is from the blog of Clay Gentry where it appeared under the title Slave: The Christian’s Identity in Christ. Note the difference between the way the word was understood then as compared with today. Total Dependence on the Master. To accept these lessons is to accept we are slaves of Christ. A notch book is John MacArthur’s book: Slave: The Hidden Truth About Your Identity in Christ. I found the first few chapters really good, the last few were terrible. I’ve also benefitted from: Dictionary of Biblical Imagery, edited by Leland Ryken. This was posted in September at the blog Grace Guy, and turned up on my screen just yesterday. In many denominational circles, C. H. Spurgeon is a most-quoted classic author; you can read more about him here. God challenges man to compare with his Maker even in the one matter of the rain. Can he create it? Can he send a shower upon the desert, to water the lone herbs which else would perish in the burning heat? No, he would not even think of doing such a thing. That generous act comes of the Lord alone. I. GOD ALONE GIVES RAIN, AND THE SAME IS TRUE OF GRACE. Nor his cooperation. It ”tarries not for man, nor waiteth for the sons of men” (Mic. 5:7). The rain creates the flower with its colour and perfume, and God is pleased. The full outgrowth of renewed nature comes of grace, and the Lord is well pleased therewith. Appropriately enough, today’s study is from the blog Cindy By The Sea. That sounds so relaxing right now, doesn’t it? This is her third selection at C201 — see below for other links — and appeared recently at her blog under the title And There Was No More Sea. No more sea! Can you imagine that! For those of us who live on or near the ocean, it’s a hard concept to imagine. No more sea. But, that’s what the Bible says. With three-quarters of the earth made up of water, it’s hard to imagine life without these beautiful and petulant bodies of water; a particularly disappointing thought to those of us who enjoy swimming, surfing, fishing, sailing on or just sitting beach side along one of their beautiful shores. So, why, no more sea? I was talking to my daughter Seven Stars the other day, when she brought the subject to my attention. For some reason, she had been giving it some serious thought and had a number of insights with which to share with me. After our discussion, I suddenly understood, why, there will be no more sea. Something I had never really understood or thought much about before. The Bible has a lot to say about water – both rivers and seas. And, there seems to be a clearly defined differentiation between the two. For you will notice, while there is no more sea in the new heaven and earth, there is a river. A crystal clear river that flows from the throne of God. Now, why might this be, rivers, but, no seas? Moses was drawn out of the water in a basket which was floated on top of the waters of the Red Sea. Jesus walked on the water at the sea of Galilee. Noah’s ark was lifted up and floated on the waters, which covered the earth. Where does Leviathan reside? In the sea. Where does the beast of Revelation rise up from? The sea. Do you see a pattern developing? There appears to be a clearly defined difference in the Bible between that which is in the sea from that which is on the sea? A difference, which, I believe is key to understanding, why, in heaven, there will be no sea. There was a movie by this name a few years ago, The Abyss. The abyss referring to the deepest, darkest part of the sea. But, in the Bible it is a word which refers to the bottomless pit, the underworld, the deepest part of the ocean or hell. This is the place where in Jude 1:6,7 the angels who left their first estate are held in chains. And, it is the sea that is the burial place of the wicked, who died in Noah’s flood, as well as the Egyptians who pursued Moses and the Israelites as they fled Egypt. It is against this backdrop that we see and understand the importance of Jesus walking on the water in Matthew 14:22-33. For in walking on the water, Jesus demonstrated his power not only over nature but, more importantly over the sea itself. For to place feet on is to claim dominion. And, in this instance, Jesus clearly demonstrates his power over the sea and over everything in and under it, including the abyss. But, rivers are something else. Rivers begin high in the mountains (mountain heights are always synonymous with the dwelling place of God). And, streams like God’s grace flow downward until they reach the hills and valleys below providing life to all living things as they rush along their course. Jesus was baptized in the Jordan river and it was this same river that Joshua and the Israelites passed over in order to come into the promised land. Yes, the sea teems with life and, we glorify God for his stunning creation. But, for all their beauty, they will not be found in heaven – for nothing sin stained will – and while, the sea in and of itself is not evil, from what we are told in scripture, those found within the confines of her deepest regions are …..
Also, click through to the original link for this story to see a reader comment with a different interpretation of what is meant by sea in this verse. There is a lot more depth you can get into on this particular word study; as you begin to explore more references it keeps getting more interesting! Back in June we introduced the blog ministry of Scott Daniels at The Rest That Works. Today’s post appeared there a few weeks ago under the title, Yoking around with Jesus. Not to say that we’re a bunch of cattle, but the yoke thing is growing on me (a typical Jesus paradox). Turns out, the image is common in rabbinic teaching, both from Jesus’ day and ever since. One popular teaching is: “Whoever takes upon himself the yoke of the Torah (The Judaic Law), they remove from him the yoke of government and the yoke of worldly concerns, and whoever breaks off the yoke of the Torah, they place on him the yoke of government and the yoke of worldly concerns” (Avot 3:5). According to this teaching, it’s one or the other—the ways of God or of the world, the yoke of fear or the yoke of Divine Love. As Bob Dylan says, it may be the devil or it may be the Lord, but you’re gonna serve somebody. So it’s very interesting that Jesus used the image to talk about rest — it’s such a contrast, even with much of Judaism. He was standing within Jewish tradition but saying that his work leads to relief from both the ways of the world and a burdensome experience of religious Law—and that’s exactly what I have experienced by aligning with him through the rest that works. Aligning with his “yoke” frees me to flow with Divine Love. It has the opposite effect of what one expects from the image (servitude and labor). Jesus was saying many things in using the yoke image: First, he was saying, “Do what it takes to come into alignment with me and Divine Love. It will take some effort, but doing so will free you internally. You’ll learn to keep the conditional ways of the world where they belong—in the world. This will free you to work in a whole new way.” Second, he was saying that as we learn to settle into God’s love with him and work from there, we’ll finally experience a sense of relief inside that the ways of the world or dogmatic religion cannot give—peace that passes human understanding. There is a precious gift involved. There is a pearl of great price. By definition, condition-based ways of doing things simply do not work to give what we really want—the inner peace and meaning found in being loved and loving unconditionally with God. When we align with and settle into unconditional love, we are freed to move freely and lightly in the world without being burdened inside with whether or not we “make the cut” or “are good enough.” We also become better able to free others from those conditions—- that’s love. Almost everything in the world is conditional. That’s how things work in the world. It’s how society is organized. It’s how things are governed. Meet the conditions, and you’re in. Fail, and you’re out. Challenge them, and you’re threatened until you get back in line—back into the yoke of fear that governs most things in our world. It’s the cycle of how things work. We’re always moving in and out of the fears of that cycle, and until we come home to God’s unconditional love, those fears govern us inside. They govern our minds. They rule us. That’s just no fun. It’s a continual burden that wears our souls down. It takes work to move into alignment with Divine Love, but it’s always worth it deep down inside. It feels so much better to feel an unconditionally loving spirit moving in us instead of fear, evaluations, accusations or threats. When those movements of spirit are dominant, we end up not liking or even respecting ourselves. We may be successful in the eyes of the world, but not our souls. We cannot be at peace inside when that is the case. We’re like the push-me-pull-you of Dr. Doolittle fame. But there’s more at stake than just inner peace. We have so much more to offer others when we live in alignment with God’s love. The most loving thing we can do for others at any given time is to check our internal alignment and be moving with Divine Love. It’s for us, but not just for us. It’s for our world, starting with our families, friends, co-workers and neighbors—whoever we are with. For this is how the kingdom comes, heart to heart, one heart at a time. Jesus’ invitation to enter the rest that works is a sweeping one. It’s a big deal. Coming into alignment with him and working with him in his “yoke” delivers us from fears and veiled threats, inside and out. But it does more than that. The discipline involved takes us beyond pie-in-the-sky hippie thinking. It’s not just about rest, but also what works. In this sense, it is hard work—checking our internal alignment as we go takes a lot of spiritual discipline. But the rewards of moving with Divine Love so exceed the rewards of any other way of living, there’s no question it’s worth it. Divine Love means so much to us that there’s no comparison with anything else. When we’re in the zone—feeling Divine, Creative Energy flowing in and out—we laugh at ourselves for ever valuing anything more. Jesus’ way and truth really does set us free from the burdens that wear us down in the most spiritually serious ways. We need to work in the world, and want to, because there’s work well worth doing with our Creator who is creating out of Divine Love. We want to create good things, we want to keep our families safe, we want to do what’s right, but not because of threats, not because someone will get us if we don’t. We want to do what Love beckons us to do with God because it’s our innermost desire, for ourselves and for others. When we’re working in that zone, we know that we’re fulfilling out purpose on the planet. It feels right deep down inside, even if there is hard work involved. It’s work worth doing. In fact, it’s worth everything and our souls know it. More power to you in escaping the yoke of fear and settling into the unforced rhythms of Divine Love with Jesus. He will work with you if you’ll let him. He’s saved me in ways I can’t even begin to explain—especially from myself. Just ask him for help and guidance and pay attention. Look to align with Divine Love and look for leads, inside and out. He’ll work with you from there. Did God Reveal it To You, Or In You? The beauty of scripture is that no small detail has been omitted and nothing has been included by accident. This discovery was taken from the blog of Baptist pastor Brad Whitt where it appeared under the title, The Location of Revelation. Why did he say “in me”? Why didn’t he say “to me”? Wasn’t the light that blinded him and arrested him on that dusty Damascus road an outer vision? Didn’t it stop him in his tracks with a brilliance that was brighter than any noonday sun? Didn’t it block the way to his old nature and cause his life to halt in the middle of its journey? Absolutely. Surely then, this was a vision of his Lord that was presented as a picture to his eye. Not at all. Because you see, no picture can only be a picture to the eye. A thing can only be revealed to me if it has first been revealed in me. I must confess. Many times I have secretly envied those who were permitted to look upon the bodily form, the physical person of Jesus. I have found myself jealous of those who were able to see the smile on His face, to hear the encouragement and comfort in His voice. Yet, wasn’t it those very ones of whom it was said, “flesh and blood has not revealed this to you.” So, in reality it was not the eye who saw the smile or the ear which heard the comfort. It was the heart, the life, the soul. It was the responsive spirit that was bearing witness with His Spirit. The open heart that ran out to meet its completion and found in Him the fulfillment of its salvation because it found in Him all that it ever desired. That’s why God had to reveal His son in me. You see, I needed more than an audible voice, for I might mistake it for another. I needed more than to simply see handwriting in the clouds, because I might have been like a child who can’t read looking at letters in a book. I needed Him to reveal Himself in me. You see, not even the most accurate description of a sunset could declare its splendor to one born blind, and likewise no description of Jesus could properly present His glory to a loveless soul. That’s why the Spirit of love must breathe into the heart the new sensation of loving, the new experience of being loved. He must unseal the soul’s eye, unclog the spiritual ear, so that the harmonies and symmetries of His creation might be revealed. It is only in His light that we will firstly and fully see light. Only when we are rooted and grounded in love will we be able to understand His love. That love, though revealed and familiar to all those who belong to Him, is still beyond our finite comprehension. Just as parts of the southern hemisphere are, I’m sure, switching to “summer time,” as it’s called in many places, we here in North American are changing from Daylight Saving Time to Standard Time tomorrow morning. 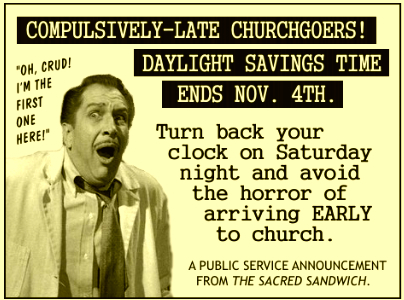 The graphic above infers that people who chronically arrive late for church may experience the horror of arriving early. I don’t know why it is, but some people who would never for a moment consider arriving late for work think nothing of arriving late for church. We touched on this very briefly here once before, but I want to look at it more closely this time. Maybe it’s because Christianity is all about grace, but we tend to have a rather casual approach to worship, to scriptures, and to God Himself. I’ve quoted this before: “It is said that of all the major religions of the world, Christians are the least acquainted with their own scriptures.” We hear stories of evangelical church buildings in disrepair, of ministry organizations that don’t return calls or emails, and of Sunday School teachers who don’t prepare their lessons, opting instead to ‘wing it’ each week. Unfortunately today, there is a great cognitive distance from thinking of our firstborn children, to setting aside the first part of our “increase” (which today is mostly wages, but could be investment earnings or business transaction profits) to God. Our offspring are extremely personal, but the value of our firstfruits isn’t highly regarded. In fact, we tend to look an opt-out wherever possible. Should I tithe on the gross income or the net income? Isn’t tithing an Old Testament concept? Is God interested in excellence, or does he just want our hearts? Isn’t requiring weekly church attendance more about law than grace? Personally, I think that arriving late for church is symptomatic of a greater problem. Or several problems. The same goes for halfhearted singing, preaching, praying and serving. 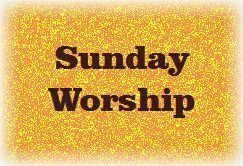 We should approach weekend worship as though we are coming directly into the presence of God because, well, we are. For myself, today an element of spiritual warfare to it which was more overt, but the feeling I was left with — or the thing that my emotions connected the dots to, the way you attribute someone in a dream to someone you know — was that of discouragement. It can really eat away at you if you let it.